Currently Reading: A Conversation with Cherie Blair on Women’s Entrepreneurship. 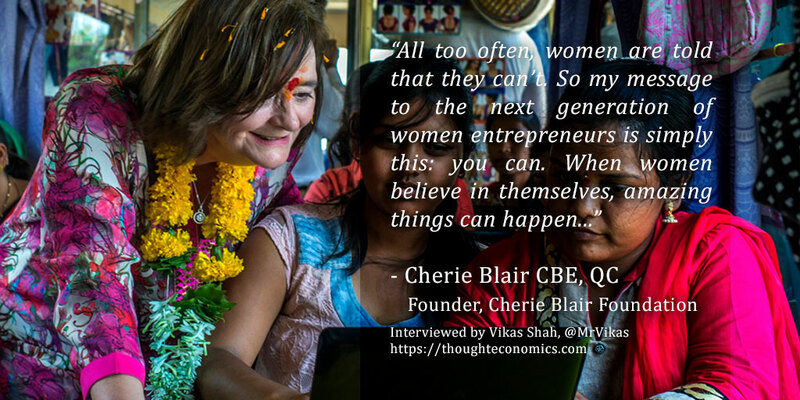 A Conversation with Cherie Blair on Women’s Entrepreneurship. Entrepreneurship has a diversity problem, and the lack of gender diversity in particular is a blight on today’s entrepreneurship landscape which simply cannot continue. In the formal sector around 37% of enterprises globally are women-owned entities, and conservative estimates would estimate that around 250 million female entrepreneurs worldwide own formally recognised businesses. We also know that female entrepreneurship has a disproportionately more positive impact on society. Women reinvest 90c on the dollar in people, and their families (compared to around 30c on the dollar for men) and female owned businesses are often more sustainable, with better working conditions, working cultures and practices. The underrepresentation of women in the entrepreneurial economy is not only costing our world tens of billions in missed economic opportunity, but is preventing us from tackling many of society’s most deep-set issues. The Cherie Blair Foundation for Women supports women entrepreneurs in developing and emerging economies to access the skills, technology, networks and financial services they need to become successful business owners. They have supported over 140,000 women from 100 countries, and I caught up with Cherie to learn more about how we can empower women’s entrepreneurship worldwide. Q: What are your views on the state of women’s entrepreneurship today? [Cherie Blair] While strides are being made, women’s entrepreneurship still lags men’s in all but seven countries in the world. The barriers facing aspiring women entrepreneurs in places like the UK are only amplified for those operating in developing and emerging economies. Many women, for instance, work in isolated areas, far from the services and infrastructure that we take for granted, while others face major challenges accessing financial services, or encounter resistance from family members when they try to set up an enterprise of their own. In 2008, I established my own charity to empower women entrepreneurs in developing and emerging economies to access the skills and tools they need to overcome some of these barriers. With the right support, these women can go on to build thriving businesses and achieve amazing things – not just for themselves, but for their families, communities and economies too. Q: What are the key challenges faced by female entrepreneurs worldwide? [Cherie Blair] It’s hard to generalise across all contexts, but there are a couple of fundamental challenges that I think could be applied across the board. Firstly, gender stereotypes and attitudes towards unpaid care work means that domestic duties are primarily placed on women’s shoulders. This can have a huge and detrimental impact on their ability to participate in the economy – whether as employees or entrepreneurs. Another key challenge is a lack of access to training and financial services. The International Financial Corporation estimates that around 65% of women-owned small and medium enterprises in developing economies are underserved by financial institutions, representing a financing gap of $260-320 billion. Educational inequalities compound the issue, since women often lack the financial literacy, skills and confidence needed to effectively manage their finances. Q: What are your views on gender inequality and gender pay gaps in developed economies, and the impact that has? [Cherie Blair] Sometimes it’s hard to shake the feeling that we are slipping backwards, but I’m an optimist at heart. We have a long way to go, but if history has taught us anything, it’s that women rarely win anything without a fight! When the Equal Pay Act came into force in the UK in 1975 I assumed that pay inequality would be ‘fixed’ within a matter of years. However, a Deloitte study shows that if we continue at today’s rate of progress, parity won’t be reached until 2069. On a global level, last year the World Economic Forum warned that we are still a shocking 170 years away from achieving economic equality. These issues affect women and men everywhere, so it’s crucial that business leaders and governments take action. For example, new laws in the UK will force companies employing more than 250 people to reveal data on their pay disparities. Identifying inequalities is just the first step though – organisations must take firm action to eliminate discrimination and ensure that all employees receive the same opportunities for fair pay and career progression. Unless women have the chance to take up an active role in our economies and fulfil their potential, our ambitions for a fairer and more prosperous world simply won’t be realised. Q: What are the outcomes for a society where we promote more women entrepreneurs? [Cherie Blair] I believe that working towards women’s economic empowerment at the global level is the single most important battle we will fight in our lifetime, and that’s because harnessing the incredible talents and potential of women is not only the right thing to do – it will also create stronger economies and a fairer society for all. Research shows that empowering women to gain financial independence generates lasting impact, with women typically investing 90% of their income back into their families. In addition to this, McKinsey estimates that if women and men were to play an identical role in labour markets across the world, an extra $28 trillion would be added to the global economy by 2025. I’m always so inspired by the positive ripple effect so many women entrepreneurs I’ve met around the world have triggered. Many go on to become leaders in their communities, sharing their newfound knowledge with others and creating new job opportunities. For example, 3,000 new jobs were created through our Skilling for Change project, which provided financial literacy and investment readiness training to over 16,000 women in Rwanda. Q: How does women’s entrepreneurship play a role in international development? [Cherie Blair] The UN acknowledges the vital importance of women’s economic empowerment in a number of its Sustainable Development Goals (SDGs), including SDG 5, which is specifically focused on achieving gender equality and empowering all girls and women, and SDG 8, which aims at promoting sustainable economic growth through full and productive employment and decent work for all. In many economies however, decent work is hard to come by – even where higher education rates are comparatively high. For example, in India one of the primary reasons cited for the declining rates of female labour force participation is the lack of job creation generally. According to the World Bank, India only created jobs equivalent to 0.9 percent of the adult population between 2005 and 2012 – and most of these regular wage jobs created went to men. This is where women’s entrepreneurship offers a huge opportunity. Where decent jobs are scarce, women can achieve financial independence by becoming job creators rather than job seekers – providing, of course, that they have the right support and opportunities to do so. Q: How can we increase capability in women’s entrepreneurship? [Cherie Blair] This is a crucial part of what my Foundation does. We enable women to realise the full extent of their entrepreneurial capabilities by increasing their access to the skills, knowledge, financial services and markets they need to become successful business owners. Our Road to Growth partnership with the ExxonMobil Foundation, for example, delivered business and financial literacy training to 500 women in Nigeria, through a combination of classroom teaching and online modules. This ‘blended learning’ approach allowed the women to balance their training with running their businesses and keeping on top of their other commitments. The success of this project is also a testament to how technology can be a great enabler for women entrepreneurs. I believe that technology has the capacity to break down barriers and open up opportunities for women’s economic empowerment on a huge scale. Q: How can we increase confidence in women’s entrepreneurship? [Cherie Blair] Countless research on barriers to women’s entrepreneurship shows that a lack of confidence is one of the most common issues raised by women across many different contexts. The ‘confidence gap’ begins to manifest itself in girls at an alarmingly young age. For example, a recent study on gender stereotypes and children’s perception of brilliance revealed the worrying fact that girls start doubting their own intelligence and capabilities as early as age six. As adults, this confidence gap can halt many aspiring women entrepreneurs in their tracks before they’ve even gotten their idea off the ground, which is why building skills and self-assurance is an important strand underlying all of my Foundation’s work. Our online Mentoring Women in Business Programme provides encouragement as well as practical support. It utilises technology to offer cross-border support to women entrepreneurs in developing and emerging economies by matching them with men and women mentors from around the world. Mentees also have access to a huge range of resources and opportunities for learning and networking via our bespoke online platform. Q: How can we increase access to capital in women’s entrepreneurship? [Cherie Blair] Access to capital is a vital ingredient for business success, but it is one of the biggest challenges for women entrepreneurs globally. My Foundation works with both women and financial institutions to improve women’s access to financial services. We run bespoke training programmes helping women to effectively manage their business accounts and understand how loans or credit can get them to the next stage. We also encourage banks to deliver tailored financial products and services for women entrepreneurs. For example, as part of our Advancing Palestinian Women Entrepreneurs project in the West Bank, we partnered with the National Bank to support women to apply for loans with an interest rate of 7%, and we negotiated a new agreement with the Bank of Palestine to reduce loan interest rates from 20% to 5%. Looking at issues facing women entrepreneurs operating in developed economies, gender biases have been proven to impede women entrepreneurs’ ability to access investment, particularly from Venture Capitalists. However, it’s really encouraging to see how women are circumnavigating traditional funding mechanisms that might be inaccessible to them – for example, a recent PWC report showed that women entrepreneurs are considerably more successful at crowdfunding then men. Q: What would be your message to the next generation of women entrepreneurs? Wife of former British Prime Minister Tony Blair, leading lawyer and committed campaigner for women’s rights, Cherie set up the Cherie Blair Foundation for Women in 2008 to help women build small and growing businesses in developing and emerging markets so that they can contribute to their economies and have a stronger voice in their societies. As well as fighting for human rights in her professional career, Cherie is an active campaigner on equality and human rights issues. In addition to founding her own charity, Cherie remains closely involved with charities with a special emphasis on women and children. Cherie was an Ambassador for London 2012, supporting the bid to host the Olympics in the UK and was awarded a CBE in the 2013 New Year’s Honours List for services to women’s issues and to charity in the UK and Overseas.